Guests listen to the first student presenter, Gloria-Dalton. Linford and Holman share analysis of auto collisions. 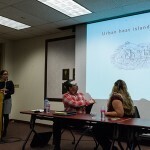 Rivera discusses urban heat islands. 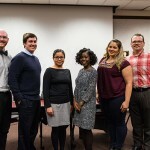 The research projects undertaken by students and their faculty mentors investigated vulnerable populations in the community. Matthew Gloria-Dalton, a communications studies student, reviewed portrayals of mental illness in mass media. Christal West, a Mexican American studies student, explored the role of ethnic studies in informing trauma intervention for youth of color. Ida Wilson, an anthropology student, examined the underground economy in Oakland. 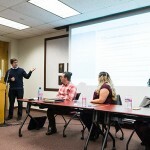 Other presenters included John Linford and Joseph Holman, economics students who studied automobile collisions in California, and Ana Lucrecia Rivera, a geography and global studies student, who identified urban heat islands that can impact vulnerable residents in Santa Clara County. 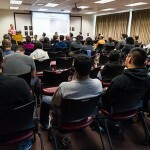 The colloquia was supported by the Academic Affairs RSCA and Professional Development priority group work from 2014-16. Research opportunities are an integral high-impact practice in SJSU’s Four Pillars of Student Success student engagement pillar.